Distal radius fractures are also known as wrist fractures or Colles’ fractures. They are one of the most common fractures seen by our Orthopaedic surgeons. They occur in all age groups, and can be due to any kind of injury. 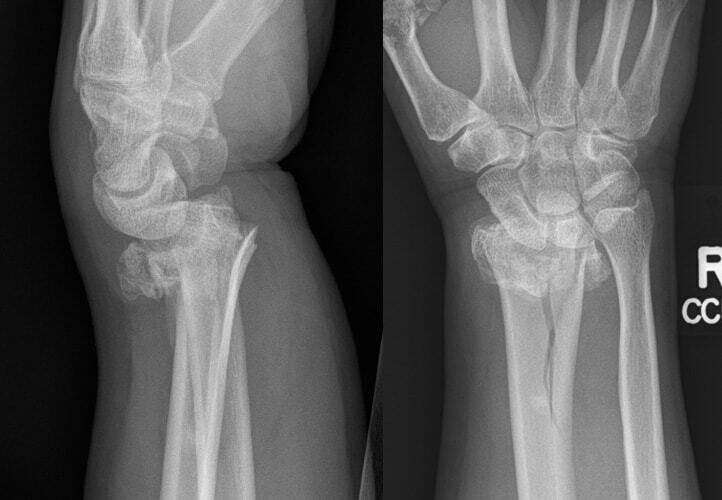 We pay particular attention to wrist fractures occurring from relatively minor injuries in patients 50 years or older, as they may be a sign of osteoporosis. Casting: The current splint or cast will be changed to a new cast when it is safe to do so, and the cast will be kept on for an average of 6-8 weeks. 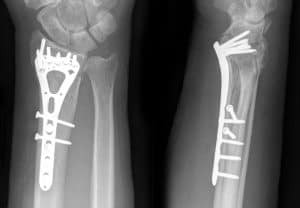 Re-Reduction: Your surgeon may recommend an attempt at re-setting the bone, which may be done in fracture clinic or the operating room. 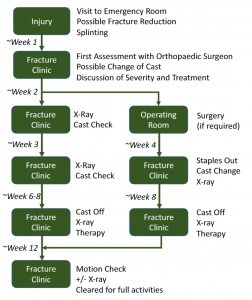 If successful, the cast will be kept on for an average of 6-8 weeks. An Operation: if the injury is severe enough an operation may be suggested. The surgery is designed to do what a cast may not be able to do in all instances – to achieve the best possible alignment of the fracture. This can be achieved through plates and screws, pins or an external-fixation device. It is important to remember that a perfect reduction following an operation does not guarantee perfect function. We recommend surgery when it is necessary to better align a severe fracture. Casting Alone: Patients are followed weekly at the discretion of surgeon until Week 3. Cast changes may occur during this time. Early X-rays assess alignment but cannot determine healing. At 6 weeks following injury, the cast is removed and an X-ray is obtained to assess for healing of the fracture. Additional casting may be required should the fracture not be fully healed. After the cast is removed, a removable wrist splint is often applied for another 2-3 weeks to protect the wrist from additional injury during the initial stages of therapy. After Surgery: Patients are seen at 2 weeks post up for removal of staples and cast change. Casts are removed at 4-6 weeks post operatively, a removable wrist splint applied, and therapy started. All casts should be kept clean and dry. Swelling is common following an injury or fracture. To decrease swelling, keep your limb elevated and consider icing it 15 minutes at a time every 1-2 hours. Ice should be wrapped in a tea-towel to avoid frost-bite. Casts should be snug but not excessively tight. If your cast begins to feel too tight, first keep your limb elevated and consider icing to decreasing swelling. If this does not address the issue, present to the emergency room for reassessment. Cracking or weakening of the cast is not normal and may require reinforcement or reapplication of a cast. Do NOT place anything between your cast and your skin! We appreciate that casts can become itchy, but blindly scratching inside the cast can cause scratches which may become infected. Consider a hair-dryer on low setting for some relief of itching. Please note: this alone does not constitute as a formal referral to a physical therapy. While Casted: Work on active and active assisted range of motion of your fingers/thumb, elbow and shoulder to prevent stiffness. 1-2 weeks following cast removal: Continue with finger/thumb, elbow and shoulder motion as above. Build in active wrist range of motion (flexion, extension, palm-up, palm down) within tolerance of pain. Continue to wear the removable wrist splint when not performing exercises. 2-6 weeks following cast removal: Goal is to regain 80% of wrist and finger motion during this time using active, active assisted and passive exercises. 6 weeks or more following cast removal: Add in strengthening of the wrist, with sport or job specific exercises as needed. We aim to return people to 80-95% of their previous function following a distal radius fracture, with a goal of return to full duties at work before the 12-week mark. Wrist/Finger Stiffness: May require formal physical therapy over 6 months to resolve. Tendon Rupture: Sudden loss of finger motion is not normal and should prompt reassessment by your surgeon. Complex Regional Pain Syndrome: a challenging adverse pain response associated with some fractures. Requires time, physical therapy and occasionally medications to resolve.